I'm a mechanical engineer with 11 years’ experience in the field of project planning and scheduling. Projects include; civil, mechanical and electrical. 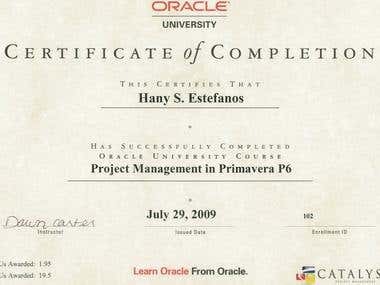 My experience could be categorized as follows: 1-Oil and gas projects (6 years) 2-Schools construction (1 year) 3-Bridges and roads (2 years) 4-Freelance work (2 years) I’m professional in using most of the computer software and able to familiarize fast with new software with good knowledge in computer hardware. Freelance work includes: -Project Scheduling services -Mechanical Engineering services -PC software and hardware repair services. 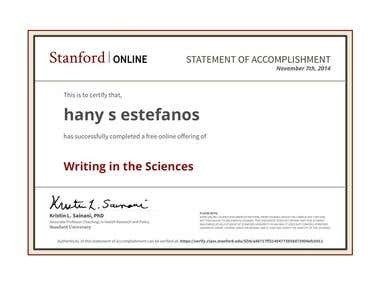 Scientific and academic writing, editing and proofreading. This course covers obtaining data from the web, APIs, databases, and colleagues in various formats, as well as the basics of cleaning and “tidying” data. It also covers the components of a complete data set: raw data, processing instructions, codebooks, & processed data. Covers exploratory data summarization techniques that are applied before modeling to inform development of complex models. Topics include plotting in R, principles of constructing graphics, and common multivariate techniques used for high- dimensional data visualization.